French lithographer and charcoal artist. 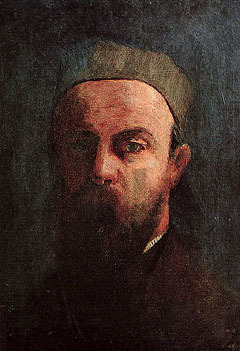 Rose to prominence as a result of praise of his art by Joris-Karl Huysmans in his classic decadent text À Rebours (1884, trans. Against Nature); his lithographs also accompanied translations of Edgar Allan Poe, and most notably an edition of Gustave Flaubert's La Tentation de Saint Antoine. The bulk of Redon's artwork is terribly dark, using layer upon layer of charcoal and black chalk to shroud his (often clumsy) occult figures in clumps of dense shadow. From the 1890s on he abandoned his charcoals to focus on oil painting.